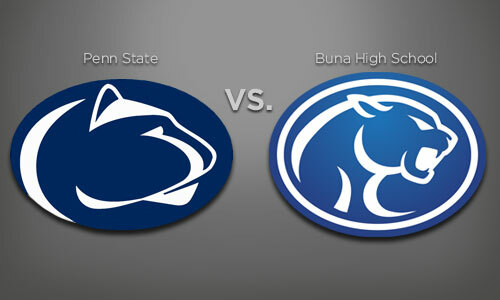 The recent scandals that are racking Penn State right now have brought up an interesting dilemma of which Buna High High School no longer has to worry about being associated with (other than this blog post and all the past hoopla over copyright infringement and cease and desists that will remain searchable on the innerwebs). 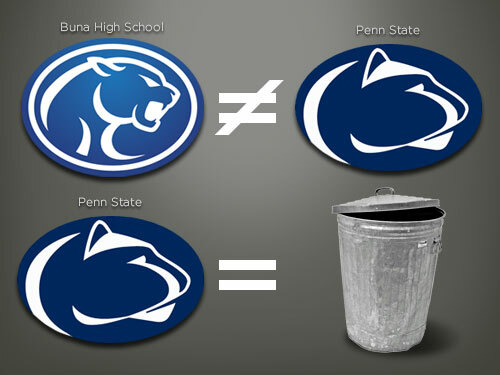 Right now, I would imagine any school or athletic association involving young boys that may have been “inspired” to use the Penn State Nittany Lion logo are now (or should be) scrambling to divest themselves of any connection to this brand. Because the Penn State Nittany Lion as a brand, now represents a tarnished, dare I say, trashed brand that will invoke emotions of outrage and scandal for many years to come. Just thought I’d post a quick link to a New York Times article that ran today that outlines the plight of high schools across the country that are facing the legal issues of trademark infringement with the colleges and universities that they have “borrowed” for their own mascot logos. Buna High School and Penn State are mentioned very briefly in passing, but it’s resulted in an increase of searches reaching the original Buna Trademark Infringement article I posted back in June. I think the bottom-line is that it’s easy to think of the big schools as the “bullies” picking on these poor little ol’ high schools who just want to have a decent mascot to showcase their school pride, but it highlights the issue of how valuable an identity can be to an organization that has invested resources, both financial and the physical effort of building a winning sports program that elevates the status of that mascot identity and how important it is to protect that investment from being trivialized by overuse by other organizations that haven’t made that same investment.